Another recent arrival has been a mother and daughter, Antardhyana dasi and Manisa dasi. Manisa is initiated even though in her early teens, but she is terminally ill with leukemia. Having given up any hope of a cure, they have come here so that Manisa can leave her body in the holy dhama. They requested a darsana with Srila Prabhupada, and he received them this morning just before his massage. When they came in, Manisa burst into tears as they explained her condition and prognosis. She is frightened by the prospect of imminent death and is clearly not mentally prepared for it. Despite the girl's weeping, however, Srila Prabhupada was firm and spoke rather strongly, focusing in on the reality of her condition. Rather than offering sympathies with some sentimental, body-based words of solace, Srila Prabhupada cut through the fear and doubt shrouding his disciple's mind and intelligence and met the problem head-on. "Everyone is going to die," he said. "Who is going to live? Who is here? Can you show me anyone who is going to live? Can you show me?" Antardhyana shook her head. "No. Everybody's going to die." "So today or tomorrow, everyone will die," he affrmed. "So where is the anxiety? Die or not die, tomorrow or today, but one should chant Hare Krsna, that's all. Why one should be depressed? And everyone is going to die. I am going to die tomorrow, he is going to die day after tomorrow -- everyone will have to die. Who will live here? So what is the anxiety? Chant Hare Krsna. That's all." Jagadisa told Srila Prabhupada that she had come to die in Vrndavana. "Nobody will live," Prabhupada repeated. "Don't be in anxiety. That's all. Anyone who has come to this material world will die. One is going to die today; another is going to die tomorrow. It is a question of first and second, but everyone will die. So before death one should be complete in Krsna consciousness. That is success of life. The tree is standing for thousands of years. So what is the use of living like that? A tree cannot chant Hare Krsna but lives for thousands of years. Do you think that kind of living is very worthy, standing in one place, cannot move even, and what to speak of chanting? So you have got the chance to chant Hare Krsna. Utilize that. Don't be anxious that 'I am going to die.' Who is going to live? Why don't you understand that? Nobody is going to live. So before death one should be complete in Krsna consciousness. That is success." Prabhupada's direct and practical words helped Manisa focus. She stopped sobbing and regained her composure. But still she had a fear. "But if one is not, Srila Prabhupada, what will happen?" Prabhupada didn't quite understand her query and I repeated it. "If one is not complete in their Krsna consciousness then what will happen?" "She will get again birth in a human body," he assured her. "That is guaranteed so that he'll get again chance of chanting. That is also great gain. Ordinary person, he does not know what body he is going to get, next body. But a person who is in Krsna consciousness, chanting, he is guaranteed. Sucinam srimatam gehe (Bg. 6.41) -- he is guaranteed to take birth as human being in a very sacred family like brahmana and very rich family." 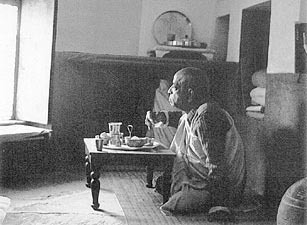 Because he had other commitments, Prabhupada had to end the darsana at that point. "So I have to go." Despite the meeting being so short, however, Manisa was visibly relieved and thankful. His words had struck home. "Thank you, Srila Prabhupada," she said. "Hare Krsna. Nobody is going to live here," Prabhupada told her again as he rose from his seat. "Everyone is going to die. Before death, chant Hare Krsna." With a compassionate smile of reassurance to his young disciple, he added, "Don't be worried." Manisa's mother, though, still sought some further comfort. "She is worried, Prabhupada, about... " "What is the worry?" Prabhupada interjected "I have already said everyone is going to die." Antardhyana managed to be very specific. "She is worried about seeing the Yamadutas. This is what she is worried about." Prabhupada addressed Manisa directly and repeated the practical formula for overcoming death. "Chant Hare Krsna. Always think of Krsna. That's all." Manisa nodded, accepting his words as the proper solution. "Yes, Srila Prabhupada." "This is our business," Prabhupada concluded. "The cats and dogs cannot do this. That is the advantage of human form of body." Both the mother and daughter were grateful and happy to get a few words of encouragement and guidance. Manisa left feeling heartened by her first personal meeting with her spiritual master, and the two of them will reside in the guesthouse until her departure. From A Transcendental Diary, Volume 5. Just released in March 2005. This volume covers Srila Prabhupada's activities during October and November 1976, in Aligarh, New Delhi, Chandigarh and Vrindavana-dhama. Readers interested in obtaining a copy of A Transcendental Diary, Volume 5, can obtain further information by visiting http://www.lotusimprints.com or writing to the author, hari.sauri.acbsp@pamho.net.